Despite anecdotal evidence that recessions affect marriage and divorce rates, researchers do not agree about the direction and magnitude of the relationship. 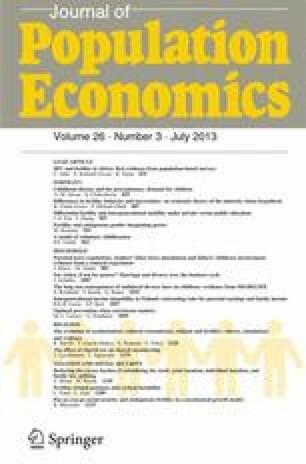 This paper reexamines the effect of business cycles on flows into and out of marriage, finding that increased unemployment rates are associated with reductions in both outcomes. The results are robust to the use of alternative measures of economic conditions, hold for both blacks and whites, and are concentrated among working-age individuals. Lag specifications and impulse response functions suggest that the effect of an unemployment shock on marriage is permanent, while the effect on divorce is temporary. I would like to thank the editor, Erdal Tekin, two anonymous referees, Ann Huff Stevens, Hilary Hoynes, Douglas L. Miller, and seminar participants at the University of California, Davis for their helpful comments and suggestions. I acknowledge financial support from the American Association of University Women American Dissertation Improvement Fellowship and the George and Dorothy Zolk Fellowship in Economics at the University of California, Davis.